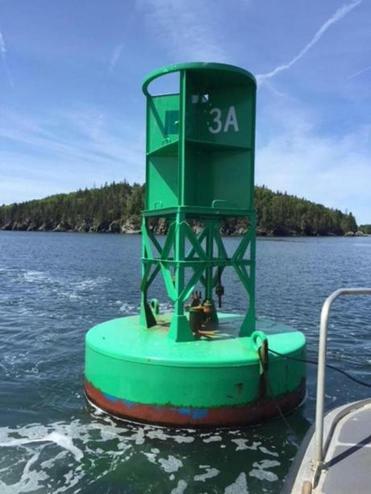 The gong at the Eagle Island buoy was recently stolen, according to the US Coast Guard. Mariners rely on the sounding devices to guide them past hazards. Along the rocky inlets and foggy harbors of Maine, the Coast Guard maintains about 100 large buoys that use heavy brass gongs and bells to help guide mariners to port in the worst weather. Now, to their dismay and bafflement, some are disappearing without a sound. Over the past seven months, gongs and bells have been stolen from eight of the buoys, arduous thefts that require special tools, considerable navigation skills, and a lot of chutzpah. The thefts have occurred between 800 feet and 1.5 miles from shore, presumably at night, from Penobscot Bay to Jonesport, he said. Investigators believe the thieves are selling the 300-pound bells and 75-pound gongs to nautical novelty shops or metal yards. Made of a copper-silicon alloy, the navigational aids can fetch hundreds of dollars for scrap. The Coast Guard is working closely with local law enforcement, shops, and scrap yards to identify suspects, Fransson said. Tampering with navigation aids is a federal offense that can lead to up to a year in prison and fines up to $25,000 per day. Many mariners rely on the sounding devices, especially small-boat lobstermen who lack radar and other sophisticated navigation equipment, to guide them past hazards. The Coast Guard has replaced half of the stolen bells and gongs so far, at significant cost. Each set of bells and gongs costs about $5,000 to replace, not including the time and equipment involved, Fransson said. To protect the devices against theft, the Coast Guard has been sailing around the region, using blowtorches to weld the nuts and bolts that secure the gongs and bells to the buoys. While no one is known to have been hurt as a result of the thefts, Lieutenant Matthew Odom, waterways management division chief of Sector Northern New England, said Coast Guard officials are concerned. “These thefts . . . put lives at risk,” he said. Crew members on the Coast Guard cutter Willow worked on a bell buoy in 2013.